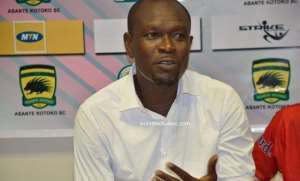 Ghana FA presidential hopeful, George Afriyie has implored the management of Asante Kotoko to stick with CK Akunnor. After failing to book a quarterfinals berth of the CAF Confederations Cup, multiple reports have emerged that the former Dreams FC gaffer will be shown the exit. But the Okyeman Planners bankroller wants that idea to be nullified claiming that sacking the former Black Stars skipper will be a bad idea. "I think sacking CK Akunnor will be a bad idea," he said. "He must be given the needed support because he just came in but he has done well in Africa. "He must be pressured because he has done well and I think when we all support, he will do greater things for the club," he added. The Porcupine Warriors were eliminated from the group stage of the CAF Confederations Cup after losing to Zesco United in their final Group C game in Ndola. Kotoko finished the group on the 3rd position with 7 points.